The climate here has definitely changed. Legislation to control global warming that once had a passionate but quixotic ring to it is now serious business. Congressional Democrats are increasingly determined to wrest control of the issue from the White House and impose the mandatory controls on carbon dioxide emissions that most smokestack industries have long opposed. Four major Democratic bills have been announced, with more expected. One of these measures, or a blend of them, stands an excellent chance of passage in this Congress or the next, industry and environmental lobbyists said in interviews. Many events have combined to create the new direction — forsythia blooming in lawmakers’ gardens in January, polar bears lacking the ice they need to hunt and Al Gore’s movie, “An Inconvenient Truth,” along with pragmatic executives seeking an idea of future costs and, especially, the arrival of a Democratic-controlled Congress. There was evidence of the changed mood all over Washington this week. Another news conference on Wednesday featured executives of the heavily regulated electric utility industry embracing Senators Dianne Feinstein of California and Thomas R. Carper of Delaware, both Democrats. The senators were offering separate bills to add regulations, including a cap on carbon dioxide emissions. One sign of the Democrats’ determination to move on climate bills occurred when a Democratic Congressional aide confirmed that Speaker Nancy Pelosi wanted to create a special committee on climate, apparently an end run around Representative John D. Dingell, the Michigan Democrat who is chairman of the Energy and Commerce Committee. Mr. Dingell’s firm support of the automobile industry, a leading source of carbon dioxide emissions, and his earlier lack of enthusiasm for climate measures have made him suspect among advocates of strong climate laws. To add excitement, the man of the moment, Senator Barack Obama, Democrat of Illinois, lent his name to the best-known brand in climate-change legislation, a measure by Senators John McCain, Republican of Arizona, and Joseph I. Lieberman, independent of Connecticut. That means that two of the three sponsors, Mr. Obama and Mr. McCain, are leading presidential contenders in 2008. Neither party is united around any one position. And for all the flurry of news conferences and proffered solutions, the big unanswered question was what will President Bush do? A tantalizing hint came from James L. Connaughton, chairman of the president’s Council on Environmental Quality, in an interview on Tuesday. “There are a number of pathways for getting to a shared goal, and we should explore all of them,” Mr. Connaughton said. 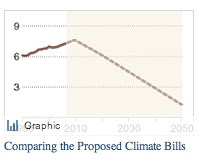 That suggests that some version of an emissions cap may eventually win White House support. Persistent rumors that the president might support an emissions cap, circulating in Washington and Europe, were rejected Tuesday by his press secretary, Tony Snow. But White House aides have hinted for months that Mr. Bush was planning a dramatic announcement on the subject in his annual address. Last year, the president said, “America is addicted to oil,” and stimulated a debate over dependence on foreign oil that has overlapped with environmental groups’ calls for cleaner-burning domestic fuels. The mechanism that Mr. Snow ruled out is the basis for most of the Democratic measures, capping carbon dioxide emissions and then giving or selling to companies allowances, effectively permits to create a certain level of emissions. Cleaner factories or utilities could then sell the allowances and gain a new revenue source. Factories with higher than allowable emissions would have to buy the permits they need. Such a market, already in effect in Europe, in theory would set a price for a ton of carbon dioxide emissions, and the market would stimulate innovation in technologies that would reduce emissions or produce goods or power without the same high emissions common today. Diplomats and environmental groups speculated in Washington this week that the Bush administration would look at other mandatory actions, perhaps not an emissions cap but rather expanding the decision to increase marginally fuel-economy standards for light trucks. A similar move for passenger vehicles, coupled with a call for sharp increases in ethanol and other renewable fuels plus new money for research into clean-energy technologies would be a bouquet approach that would expand policies Mr. Bush has put forward. European allies have been trying to nudge Mr. Bush toward their cap-and-trade model. The White House says that would shift jobs, and emissions from one country to another without slowing worldwide growth in emissions. The president’ s opposition to mandatory caps retains strong support on Capitol Hill. The Democratic bills announced in the last two weeks cover a broad range. A proposal by Senator Jeff Bingaman, the New Mexico Democrat who is chairman of the Energy and Natural Resources Committee, would decrease the rate of emissions growth before capping emissions and would build in a “safety valve,” freeing industries from the caps in certain circumstances. Groups like Environmental Defense say the safety valve would undermine market mechanisms. The Lieberman-McCain approach is tougher on industry, tightening emissions controls in a stepwise fashion over time, and includes subsidies for nuclear power. An emissions cap for just utilities is the centerpiece of yet another bill, by Ms. Feinstein. Some scientists and economists have expressed concern in recent weeks that the discussions here is overly focused on emissions caps, with too little attention on what they say is an essential need, greatly expanded government-financed research on nonpolluting energy technologies. Richard G. Richels, a climate expert and an economist at the Electric Power Research Institute, an organization in Palo Alto, Calif., that conducts energy studies for the utility industry, said a carbon dioxide cap would mainly prompt industry to deploy existing cleaner technologies that provide gains, but fail to come close to solving the climate problem. Mr. Richels added that it would not spur long-term investments seeking breakthroughs like new ways to store intermittent power from windmills. I'd encourage everyone to take a look at the graphic comparing the three proposed bills (Boxer, McCain-Lieberman, and Bingaman). It quickly gets across the point that only one of them, Boxer's bill, is actually based on the science of what has to happen to avoid the most severe consequences of climate change. Bingaman's bill is pathetically weak and doesn't even get us to a reduction over current levels, simply a stabilization of emissions levels. While that's better than nothing, if we don't stabilize emissions levels at a level that can be absorbed and sequestered by the natural climate cycle, atmospheric greenhouse gas levels will continue to arise, and we'll still be in dire straits. The McCain-Lieberman bill probably has the most traction, and while it is better than the Bingaman bill (much better really), it still doesn't get us close enough to the 450 ppm atmospheric CO2 levels/2 degrees C temperature increase that we must achieve. Only Boxer's bill get's us there (or close to there), and unfortunately, it is now positioned as the most 'extreme' and 'far left' of the proposed bills, which doesn't help it's chances of passing. However, we really have no choice here. We either need a bill that gets the jobs done - i.e. does the United States' part to stabalize atmospheric CO2 levels at 450 ppm and keeps average temperature increases below 2 degrees C - or we might as well not do it. I still maintain that the worst case outcome of the 110th Congress would be the passage of a weak climate change bill. If that happens, the gathering public energy calling for action will dissipate and people will think that the problem is solved. In reality, we'll simply be delaying the brunt of climate change's effects, not preventing or mitigating them. I would encourage everyone to write, email or call your representative - your Senators in particular - to urge them not to compromise on this issue and to only support a bill that will actually get the job done, a bill that is based on science, not political considerations. (On that note, I was dissapointed to see that Barack Obama had endorsed the McCain-Lieberman bill, and not the Boxer bill, and as a potential 2008 Presidential candidate, I would also encourage you to write him to express your dissapointment that he did not endorse a science-based bill, and encourage him to shift his endorsement). While I still think it is unlikely that any good, science-based climate bill will pass President Bush's desk, it now appears that the debate on climate change legislation has begun in ernest, and the bill that will eventually pass the House and Senate and the desk of our next president will be shaped in the next year or two. It's thus crucial that those of you who are concerned with the outcome of that process make your voices heard, and make sure that your representatives are supporting the right bills. In a debate that is likely to be very complicated and will see several competing proposals, it's not simply enough to get a bill passed, we've got to make sure that the right bill passes, and that will not be easy. It is always tempting to compromise, especially on Capitol Hill, and when it comes to climate change, we can't afford to compromise. "The era of procrastination, of half-measures, of soothing and baffling expedients, of delays, is coming to its close. In its place we are entering a period of consequences." Today, we have already entered a period of consequences. From reduced snowfall and retreating glaciers in the majestic Cascade mountains, to rising sea levels and eroding shores at our beloved coast, global warming is already beginning to effect the places we know and love here in the Pacific Northwest. And the story is the same throughout the world. The debate that has apparently now begun on Capitol Hill will shape the future of the world in which we live. For all you Baby Boomers out there, we're talking about the world in which you will retire, the world in which your children will raise your grandchildren. Will they look back in 50 years and thank you for solving the dillemma of climate change and transitioning to a sustainable energy infrastructure, or will they curse your failure to act? What kind of world do you want to leave them? For members of my generation, this young generation coming to age in the early years of the 21st century, it is not a question of providing for our grandchildren - although that is not entirely irrelevent - but rather a question of what kind of world we want to live in ourselves, what kind of world we want to raise our children in. It is up to us to decide what kind of future we wish to live in, and to fight to ensure that that future is realized. It is we who will live tomorrow with the consequences of the actions, or inactions, of our leaders today. What will we decide? What will we demand of our leaders? What future do we wish to inhabit? Whether you're a Boomer, a Gen Xer, or whatever they're calling my generation these days, we must not forget: we can't afford to screw this one up! In order to insure energy and economic independence as well as better economic growth without being blackmailed by foreign countries, our country, the United States of America’s Utilization of Energy sources must change. "Energy drives our entire economy." We must protect it. "Let's face it, without energy the whole economy and economic society we have set up would come to a halt. So you want to have control over such an important resource that you need for your society and your economy." The American way of life is not negotiable. Our continued dependence on fossil fuels could and will lead to catastrophic consequences. The federal, state and local government should implement a mandatory renewable energy installation program for residential and commercial property on new construction and remodeling projects with the use of energy efficient material, mechanical systems, appliances, lighting, etc. The source of energy must by renewable energy such as Solar-Photovoltaic, Geothermal, Wind, Biofuels, etc. including utilizing water from lakes, rivers and oceans to circulate in cooling towers to produce air conditioning and the utilization of proper landscaping to reduce energy consumption. In addition, the governments must impose laws, rules and regulations whereby the utility companies must comply with a fair “NET METERING” (the buying of excess generation from the consumer), including the promotion of research and production of “renewable energy technology” with various long term incentives and grants. The various foundations in existence should be used to contribute to this cause. A mandatory time table should also be established for the automobile industry to gradually produce an automobile powered by renewable energy. The American automobile industry is surely capable of accomplishing this task. This is a way to expedite our energy independence and economic growth. (This will also create a substantial amount of new jobs). It will take maximum effort and a relentless pursuit of the private, commercial and industrial government sectors commitment to renewable energy – energy generation (wind, solar, hydro, biofuels, geothermal, energy storage (fuel cells, advance batteries), energy infrastructure (management, transmission) and energy efficiency (lighting, sensors, automation, conservation) (rainwater harvesting) (energy and natural resources conservation) in order to achieve our energy independence. "To succeed, you have to believe in something with such a passion that it becomes a reality." P.S. I have a very deep belief in America's capabilities. Within the next 10 years we can accomplish our energy independence, if we as a nation truly set our goals to accomplish this. I happen to believe that we can do it. In another crisis--the one in 1942--President Franklin D. Roosevelt said this country would build 60,000 [50,000] military aircraft. By 1943, production in that program had reached 125,000 aircraft annually. They did it then. We can do it now. The American people resilience and determination to retain the way of life is unconquerable and we as a nation will succeed in this endeavor of Energy Independence. Solar energy is the source of all energy on the earth (excepting volcanic geothermal). Wind, wave and fossil fuels all get their energy from the sun. Fossil fuels are only a battery which will eventually run out. The sooner we can exploit all forms of Solar energy (cost effectively or not against dubiously cheap FFs) the better off we will all be. If the battery runs out first, the survivors will all be living like in the 18th century again. Every new home built should come with a solar package. A 1.5 kW per bedroom is a good rule of thumb. The formula 1.5 X's 5 hrs per day X's 30 days will produce about 225 kWh per bedroom monthly. This peak production period will offset 17 to 24 cents per kWh with a potential of $160 per month or about $60,000 over the 30-year mortgage period for a three-bedroom home. It is economically feasible at the current energy price and the interest portion of the loan is deductible. Why not? Title 24 has been mandated forcing developers to build energy efficient homes. Their bull-headedness put them in that position and now they see that Title 24 works with little added cost. Solar should also be mandated and if the developer designs a home that solar is impossible to do then they should pay an equivalent mitigation fee allowing others to put solar on in place of their negligence. Installing renewable energy system on your home or business increases the value of the property and provides a marketing advantage. Nations of the world should unite and join together in a cohesive effort to develop and implement MANDATORY RENEWABLE ENERGY for the sake of humankind and future generations.